Workplace mats are ideal for areas where work is done standing in one place for extended periods of time, like production, packaging and assembly. 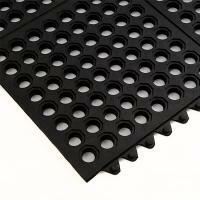 The mats are anti-slip, anti-fatigue and have shock and sound absorbing properties. The beveled edges provide additional security to avoid tripping. You can Now Print Instagram and Facebook Photos on Wood with Plastige . Plastige interlocking tile product range is versatile, durable and easy to install.